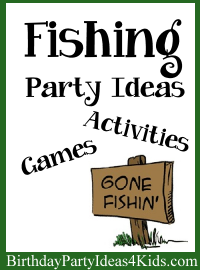 Fishing birthday party ideas and party planning help for a Fishing party for kids. Make small fishing poles out of 12" dowels by tying string onto one end and attaching a paperclip or clothespin to the other end. Clip your invitation to the paperclip or clothespin. Cut fish shapes from cardstock and decorate with paint or markers. Make message in a bottle invitations using clean / clear water bottles. Place a little sand and a few shells in the bottle and then roll up your invitation and place it inside. Decorate the outside with paint or permanent markers. Blue and Green balloons and streamers. Hang varying length pieces (1 foot to 1 1/2 feet pieces) of light and medium blue streamers from the ceiling to look like you are under the water. Hang different sizes of fish within the streamers. Cover the tables with blue tablecloths - cut a wave pattern (scalloped edge) at the bottom of the tablecloths if you are using cheap plastic or paper tablecloths. Layer different colors of blue to look like waves. 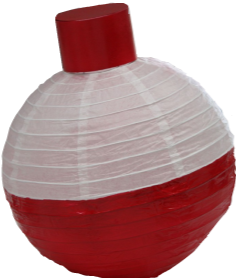 Make this cute fishing bobber decoration using white Chinese lanterns from the dollar store. Paint the bottom half bright red and add a cardboard circle painted red for the top. String together and hang over the party area or use on the party food table. Use the smaller size for a cute fishing birthday banner by painting a letter of the birthday childs name on each one of the bobbers. 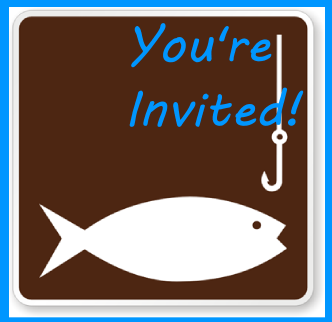 Decorate the walls with fishing nets, rods, reels, and tackle boxes. Place shells and plastic lobsters and starfish on the food table. If there is a local lake or pond near your home take the birthday guests fishing. You will need a few poles and bait. Take along a picnic lunch to eat at the lake. Set out targets on the lawn such as hula hoops at different lengths from where the kids will stand for the game and see who can cast their line and hit the targets. Instead of hula hoops set out buckets and see who can cast their line into the buckets. Players fish for prizes! Use a large appliance box, a blue sheet hung across a doorway or a covered table to create a hiding spot for an adult or older child to hide behind and give prizes to the players who are fishing. Make fishing poles by tying string to a stick and attach a clothespin on the end of the string. Birthday guests take turns "casting" the line into the "water". The person in the "water" puts small gifts, favors or candy on the clothespin and then tugs the string to signal that there is a "fish" on the line. Then kids pull up the line and retrieve their prize. Have lots of prizes because they will all want to play this game again and again! Divide guests into 2 teams. Use 2 large buckets to hold water and place at the starting line. At the other end of the playing field set up 2 plastic milk bottles - one for each team. The bottles should be the same and have a smaller opening at the top. Place a foam fish in each one of the plastic milk bottles (the fish have to float when water is added to the container). Fill the buckets at the starting line with water and give each team a sponge. One by one team players take turns dipping their sponge into the water and then running to their bottle and squeezing the water into it, then running back to the starting line and handing off the sponge to the next player on their team. Teams keep going until they can fill their bottle full enough to make the foam fish rise to the top and out of the bottle. This is a fun game that can be used as an Icebreaker when guests are arriving. Fill a clear plastic container with goldfish crackers. While filling the container count how many goldfish there are in the container. Ask the kids and party guests how many goldfish they think there are inside the container. Write down their guesses along with their name on a piece of paper. At the end of the party announce how many fish are in the container and the guest who had the closest guess gets to take the container home as a prize. Find a great place that has lots of worms and let the kids dig for their own bait. Give each child a plastic container with a lid (that has small holes punched in the top) to hold their bait. Let them take it home for future fishing outings or use it during the party if you will be fishing. Crock pot of "bait" - hotdogs in bbq sauce. Cut the hotdogs lengthwise in 5 - 6 pieces. When they cook they will curl up and look like worms. Dirt cups - chocolate pudding in cups topped with crushed Oreo cookies and gummy worms. Pond Jell-O - Place 20 - 25 Skittles (candy) in the bottom of small clear plastic cups. Prepare blue Jell-O and pour over Skittles. Refrigerate until set. With a knife cut 2 - 3 slits in the Jell-O and insert Swedish Fish. Refrigerate until party time. Sandwiches made from Pepperidge Farm fish shaped bread. Make a candy buffet using different sizes of fish bowls - fill with blue candies for water, Swedish fish, gummy worms, etc.